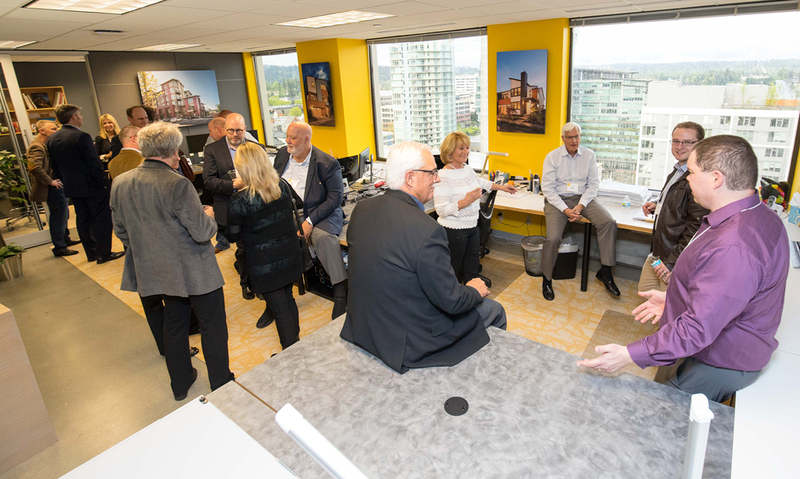 Dahlin Group Architecture Planning (DAHLIN) has opened a new office in Bellevue, Washington, to enhance and grow their presence in the Pacific Northwest with a focus on clients and design. DAHLIN Principal Tony Radovich, who has been with the firm for over 20 years, is leading the recently established location. "While this is a new office location for the firm, DAHLIN has been collaborating with local developers and municipalities for more than 25 years," said Radovich. "It's deeply satisfying to call the Pacific Northwest my home as I've been designing communities here over the last 15 years. In fact, I now live in Parkhurst, a Toll Brothers' neighborhood in Bothell designed by DAHLIN, and while our home was under construction, my family and I lived at the Spencer 68 Apartment Community DAHLIN designed for MainStreet Properties Group in Kenmore," said Radovich. According to jobs and employment reports, the Pacific Northwest will continue to experience rapid economic growth. DAHLIN believes their holistic approach to sustainability, which incorporates site sensitive and urban design principles, will help the region to grow responsibly, maximizing the potential of the region's growth while minimizing some of the negative side effects that poorly planned and designed development can have. DAHLIN's first Pacific Northwest project, Issaquah Highlands for Port Blakely Communities, is a master planned community that has matured into a mixed-use urban village that continues to thrive and grow today, exemplifying the firm's approach. Centered on a transit hub and surrounded by corporate campus employment, it links to a live/work crescent focused on a village green within the heart of the community while preserving the natural environment and hillside topography. DAHLIN Principal Lauri Moffet-Fehlberg said, "In stewarding DAHLIN's environmental conscience, I blend site specific planning and architecture, such as evaluating topography and orientation, to plan communities that work with the natural environment and how people live within them. While we've been implementing this approach in the region already, a regional office will enhance our position as advocates for responsible development." "When in a growth environment, finding the right balance between developing 'up' versus developing 'out' defines development that is sustainable and equitable," said DAHLIN Principal John M. Thatch. "We've been privileged to work with local developers on urban design and planning projects, providing housing in a variety of densities near transit, employment, and commercial and retail centers that create and contribute to thriving mixed-use urban villages." Slater 116, a MainStreet Property Group development designed by DAHLIN in alignment with redevelopment plans for the North Rose Hill and Totem Lake Business Districts in Kirkland, Washington, represents how DAHLIN has been working with developers and municipalities to bring plans like these to fruition. Slater 116 serves as a neighborhood landmark with articulated tower elements, elevated pedestrian terrace, and commercial and retail activity. Through variance in the massing and use of quality materials, balconies, plazas and landscaping, it contributes to a human scale of an activated streetscape. DAHLIN's portfolio of work in the Pacific Northwest covers a range of markets and product types that includes residential, single-family to multifamily, and commercial, such as retail, restaurant, and tenant improvement. With less than a year in their Bellevue location, they have grown to capacity and are in the process of expanding their space to accommodate hiring plans. "I believe this office is having tremendous success because of DAHLIN's unwavering passion for place, the care we feel for the life experiences of the people who live and work in those places, and our desire to support our friends who build those places is aligned with the community building opportunities here in the Pacific Northwest," said Radovich.